Oh so if I change skins, then the game will stop crashing or throwing me out - gotcha! What Utapau? Also, I want to be able to change my clone skins, otherwise why buy more than one? I love how this thread went from simple color tweaks to outright changes of body parts. The 41st camo skin bugs me the most. It looks like a lazy photoshop job. Didn’t have much of an issue with the 327th. I kind of like the 41st, to be honest. I mean, camo is camo. but what about the 41st Elite Corps?? Yeah, they should only have their camo on Kashyyyk and on Naboo it should their non-camo Phase II appearance, and Kamino should be their Phase I appearance. Please, the helmet of the clone scout trooper for 41 in Kashyyyk. LOL. Yeah, the top one is Commander Gree, a unique character, and the bottom two are phase 1 versions (probably Green Company of the 41st) that we'd see on Kamino. Good news, if we are going to have a somewhat immersion breaking mixture of multiple Clone legions at least they can be accurate to the films/Canon. To be clear, the 41st should have been the automatic default for Kashyyyk. 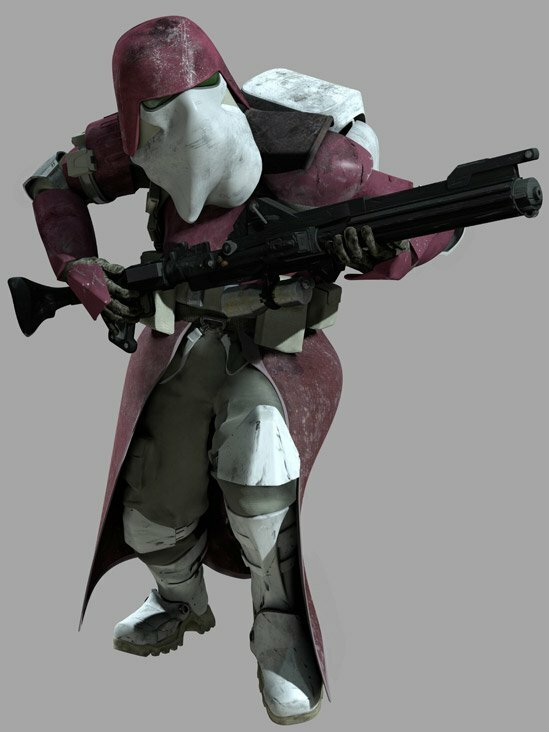 Maybe even the cruddy 41st skins we have now would work as defaults, then for buyable skins we could get the Scout Helmet (Specialist and maybe Assault), an armored Officer with the pauldron that's now on the Specialist, and the AT-RT Driver (Heavy). They could have also given us the old green-striped defaults as cheap Green Company skins for all classes. Then you could use those skins anywhere. 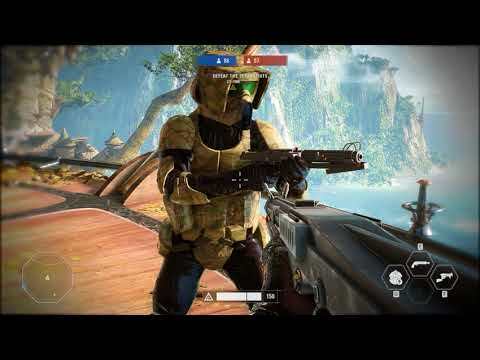 If you used the Scout Helmet on Theed where the default skin is, say, the 327th, then instead of camo it would be white with yellow markings. The AT-RT Driver would be a 327th version with yellow stripes and tan bits. And the armored Officer would be a 327th Officer with yellow stripes, or they could go with red stripes since some Captains in the 327th retained their red stripes from phase 1. And the Green Company skins would just have their stripes turn to yellow on Theed. This is great news. @JackTHorn have you seen this yet? Yeah, I saw it yesterday! Good stuff. As you say, it's great news! 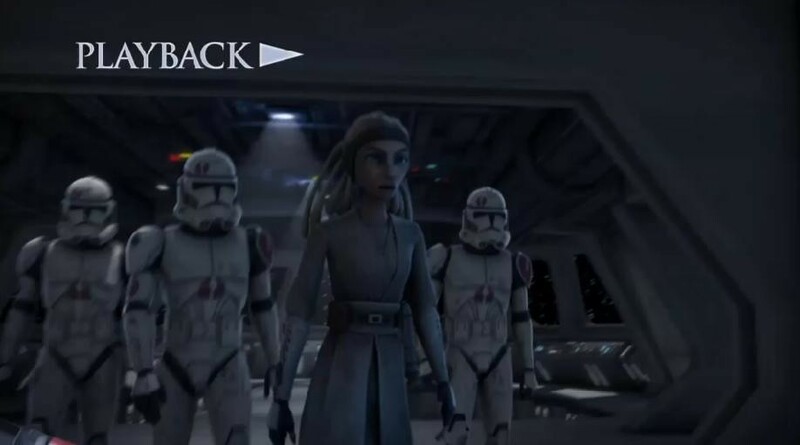 I'm hoping this is an indication that they're entering a repair phase like they had in the first summer of EABF1, when they showed they'd been listening by getting rid of helmetless Stormtroopers, and adding gamesaving content like Extraction and Sabotage. F8RGE, can you also take a look at the 41st Specialist, I believe the entire community (probably going to get in trouble for saying that) would like the Specialist to have an accurate helmet like this one. Absolutely! I could see it going for Assault too, or even for all the classes, but just the Specialist would be fine. 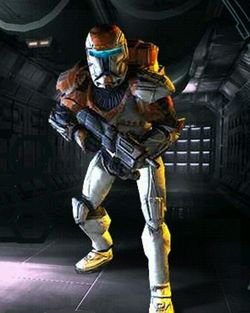 In fact, I'd go so far as to say the basic Specialist skin should be retconned to have the Clone Scout helmet, that way we can move the pauldron to an armored Officer skin where it belongs. I think, all that we need is the helmet change. The rest of the Specialist looks good. Here I have to disagree with you. While just the Scout helmet would be acceptable, better than nothing, the Kashyyyk Scout actually wore armor that was closer to the Imperial Scout Trooper, he didn't wear the same armor as a regular clone. 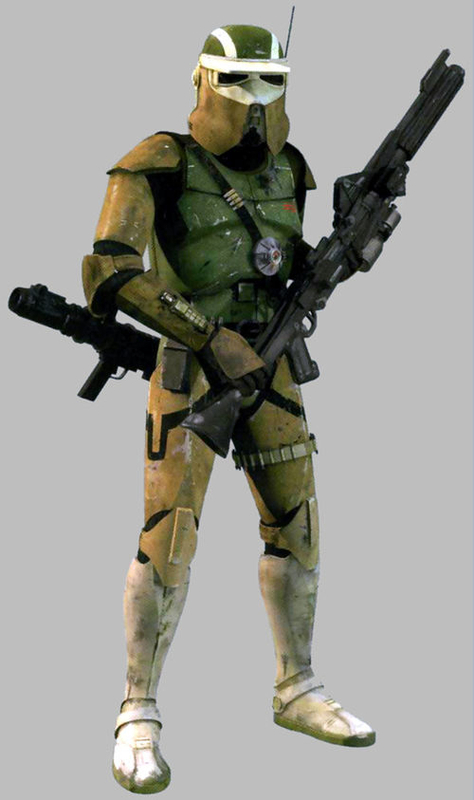 It is also worth noting that the 91st will not have red pauldrons as they are inspired by the “standard” troopers in Star Wars: Revenge of the Sith. 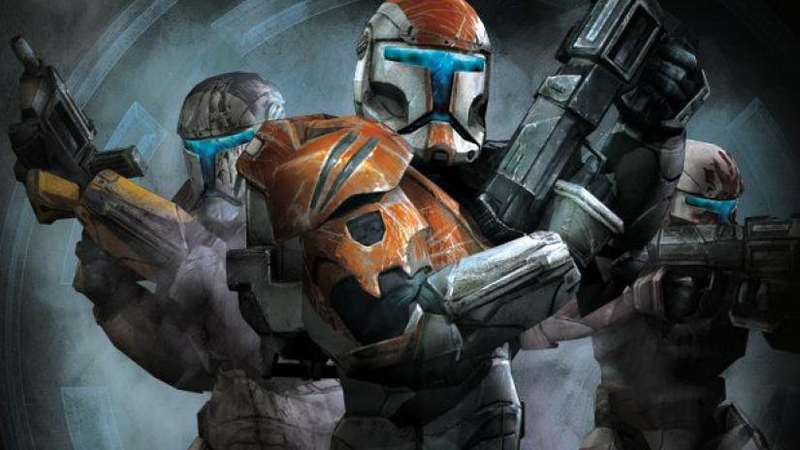 This line has me slightly concerned that you're going to get this wrong as well, because if by "standard" you mean the 91st troopers seen on the BARC speeders on Saleceumi, one of them was Commander Neyo and the other unknown, but the Recon helmet and small pauldron worn by these 2 were not the "standard" appearances. The standard appearance of the 91st was seen in the CW series and they have regular Phase II helmets as well as red pauldrons. Well done, I totally agree. Ideally, they'd make legions the defaults and open the maps to all eras, and we could have the 91st on Endor or Crait or something. Or they could even make a Saleucami map, that'd be awesome. 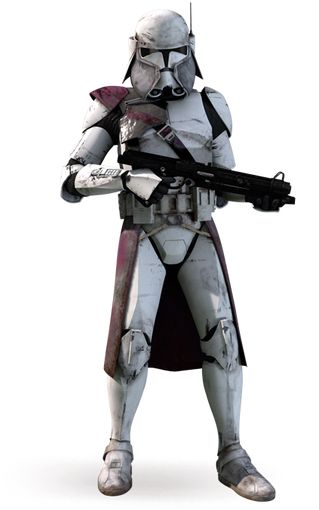 Then we could get the BARC Trooper as a Specialist skin that would change slightly from Legion to Legion, and have an armored Officer skin with the smaller pauldron. The pauldrons could start indicating rank, like they did in the last game! Small pauldron on right shoulder (taken from current Heavy) could be a Sergeant, available at Officer level 20. The medium pauldron on the left shoulder (shown in the image above) could be a Lieutenant, available at Officer level 40. And the large pauldron on the left shoulder (taken from current Specialist) could be a Captain, available at Officer level 60. And then the phase ones could match up! Sergeant gets green stripes, Lieutenant gets blue, Captain gets red... it would be SO COOL. 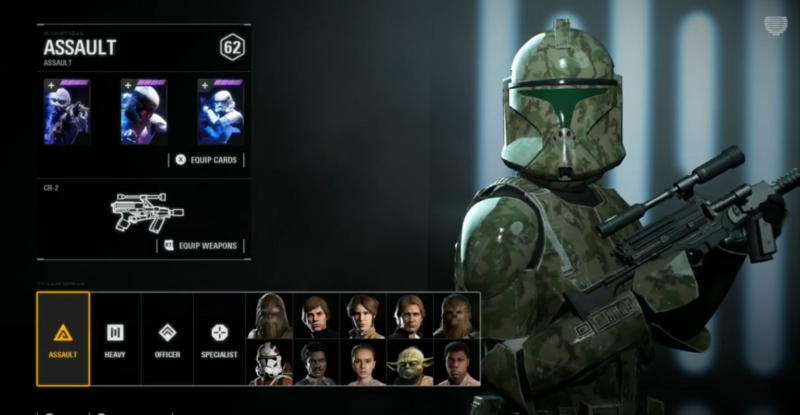 This game will remain a joke if so much emphasis continues to be placed on trooper skins. Couldn't agree more, a decent company would be releasing skins every month 5-6 at a time, on here its 6 months, get 2-3 and they try and make us feel like they've given us the world. Game is a joke, tbh i only come here to look at the joker updates, nothing changes, same old tripe for a game that died in 2017. Ever heard the saying pay peanuts and get monkeys, this happened in sep 2017 when this game ultimately failed hard, interns and low rate trainey devs at EA/Dice took over the development of this when microtransactions failed, if this has had anyone other than that working on this, like an actual proper skilled Dev team, then I really don't know what to say other than someone is seriously not doing their job right......Past 6-8 months has intern written all over it. Or the assault phase 1 variant... Just an idea. But the helmet would be nice. Switch officers to a commander. Clone armour would look like Cody's, depending on skin equipped, droid would be the same, not sure if the others would get much of a change... Rebels and Resistance would probobly stay the same, but maybe give officers general Veers type armour for the dark side. Original devs are returning, ya know. And they also know what they are doing. This isn't a thread arguing about how they failed. This is about Clone Skins. Also, I highly disagree. This game has remained alive, despite its failures. It is getting better. Microtransactions were never that important, and they were resolved months ago. They have been doing their job. The game is alive but lately this week it's hard to find one, now. Since there's 3 daily challenges in different categories. Basically play one game mode and quit and hope to find another game without a empty lobby. I am excited over the 327th color change and minor changes to the 91th and 104th in the future. This is great news. @JackTHorn have you seen this yet? 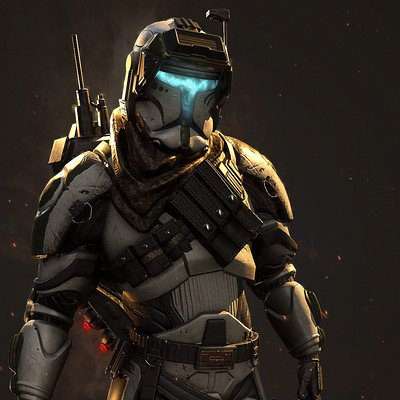 @F8RGE, can you also take a look at the 41st Specialist, I believe the entire community (probably going to get in trouble for saying that) would like the Specialist to have an accurate helmet like this one. I think, all that we need is the helmet change. The rest of the Specialist looks good. Thanks for looking into this problem and making changes. That is greatly appreciated. 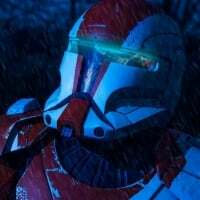 PLEASE make an ewok hunt-like mode on Geonosis with clone troopers! When in september does the september update come?? The AT-RT Driver, I just mentioned him again in another thread! Would make a good Heavy skin. 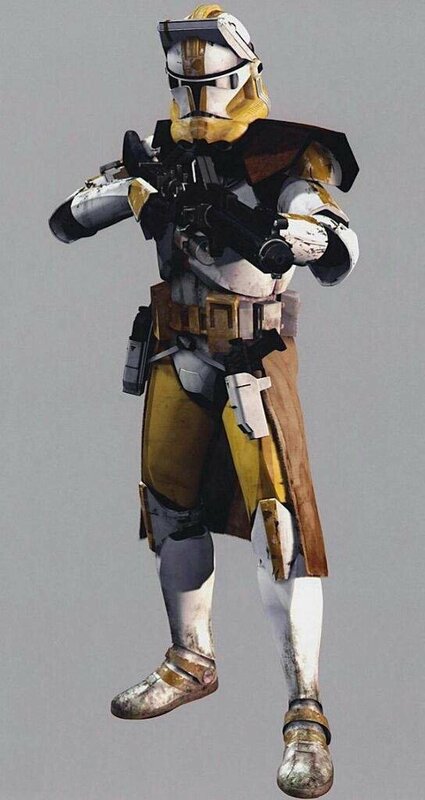 So there seems to be some debate about this particular 91st Recon Trooper. 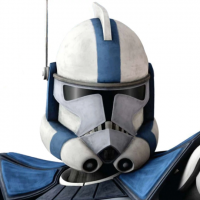 He is shown at Commander Neyo's side in RotS, but it looks like he's not a standard 91st Recon Trooper. Mainly it's the pauldron and straps -- pauldrons on Clones usually indicate leadership / Officer status. To be specific, a small pauldron on the right shoulder usually indicates a Sergeant or squad leader or NCO, while the medium pauldron on the left indicates a full officer of a lower rank (I think of it as a Lieutenant's pauldron). Oddly, this 91st Recon trooper has both pauldrons, so I'm not sure what that means... by his helmet we can tell that he's a BARC Trooper, so it might be something specific to their ranking system. Which leads me to the final item that isn't standard on this Trooper, which is his helmet. 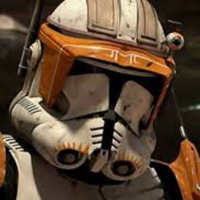 While many Troopers in The 91st Recon are BARC Troopers, that is not the standard, so most troopers in the 91st Recon wear normal phase-2 helmets. 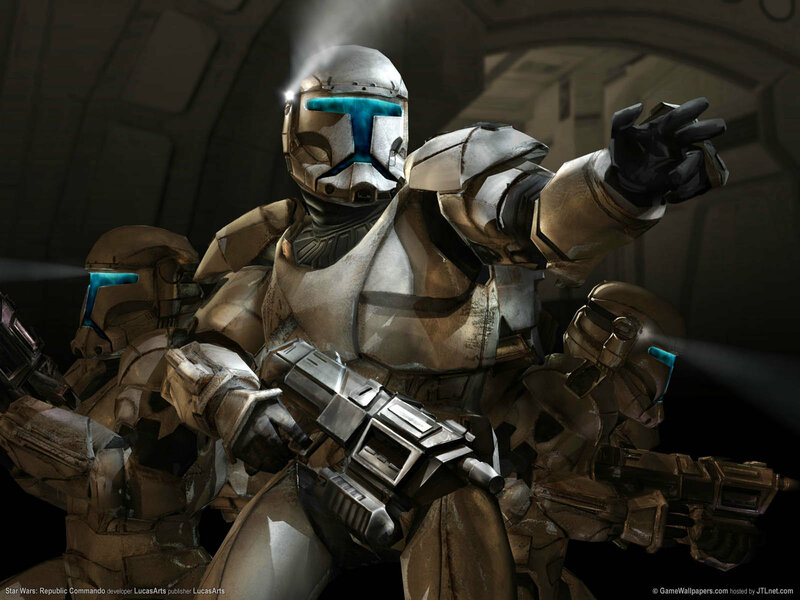 That said, a BARC helmet would be a great customisation element for Specialist clones. This is Commander Bly. His markings are unique to him, only one Clone in the entire GAR has those markings. Giving these markings to standard troopers would be like giving every Rebel the face of Han Solo. ...this guy, a standard 327th Trooper. The Airborne Trooper, or Clone Paratrooper. Another good choice. I've been pushing for this one a while now, I think it'd make a great Heavy skin. Alternately, it would also be great as an Aerial skin. 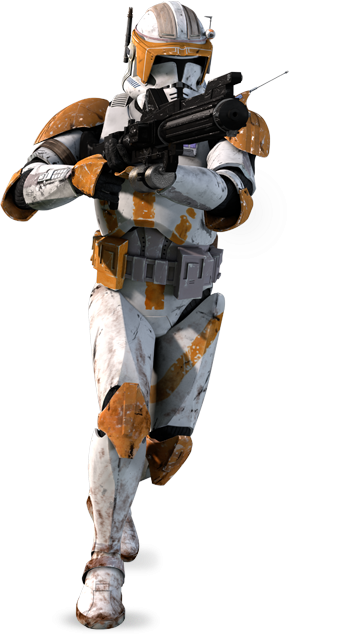 This is Commander Cody, leader of the 212th Attack Battalion. Another unique clone, not a good choice for a standard skin. 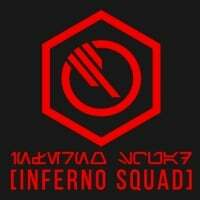 This is one of my favorites, the 21st Nova Corps Galactic Marines. I'd love to see them in game. They would fit particularly well as a Republic Enforcer, to replace the Wookiee. 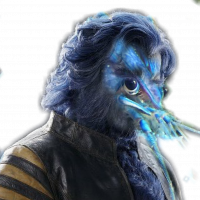 This is Commander Bacara, leader of the 21st Nova Corps. Another unique clone, not a good choice for a standard skin. Though I think his helmet style, with the reinforced cheek plates, would make a good customization element for Heavy. This is Commander Gree, leader of the 41st Elite. Another unique clone, not a good choice for a standard skin. 5 days from now, on the 25th. Nope. 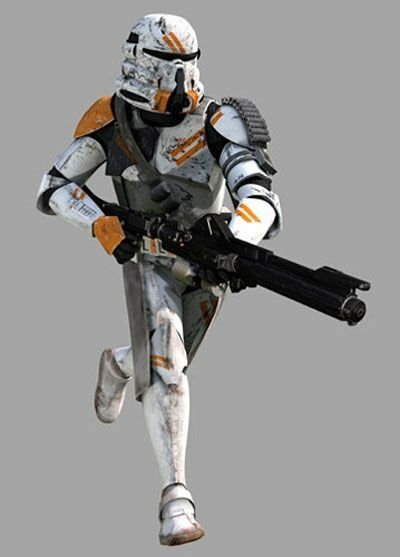 I don't know why people keep wanting the Clone Officers to look like Clone Commanders. I agree that the Officers need armored options, but you understand that each Clone Commander is the leader of an entire Legion of 200,000+ clone troopers, right? The officers we play are the low-ranking ones, the Lieutenants, the Captains. Not full bloody Commanders. That would be like asking the devs on a WWII game to make every Allied Officer look like Patton or MacArthur. Rebels and Resistance would probobly stay the same, but maybe give officers general Veers type armour for the dark side. I support accuracy and all, but I actually like the 327th skins released; por example, you can use specialist and pretend you're commander bly. People are going to hate me in this forum, but I really hope the skins remain the way they are now. Or making a legendary skin for doing stuff like that. Honestly , all they need to do is get rid of the red on the 327th and I would be satisfied. Having the red makes it look awful and super lazy on their part. I do regret getting the 41st not b/c I think they are ugly, they just aren't my cup of tea. I'd love to see Bly and Cody and Rex and Gree as heroes -- or as CW skins for heroes from other eras. I just don't want to see five or six of them running around one small battle. Thanks to the team for fixing this and to you for the communication. But you mentioned that we will get the fixed skins in a future update this winter , which probably means in the time between novembre 2018 - march 2019.
why does it take months to change and implement these skins? I mean, some modders can easily create new skins (eg. hero skins like Ahsoka) in hours or even a day? +1. He has a very good point. These modders, who most likely do the modding in their free time, pump out content as if they work for these "AAA" companies. Often times their content is free of charge and of the highest quality (only one of these applies to the content that EA/DICE delivers). 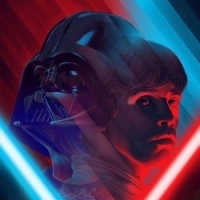 EA/DICE should think seriously about bringing in amateur modders who actually care about Star Wars and want to provide people with amazing experiences into their development teams. I think the game would be substantially better if there were some heart put into it instead of an underlying desire for profit. At the very least try to get the mods in-game. What is their "non-camo Phase II appearance" on Naboo you a referring to? 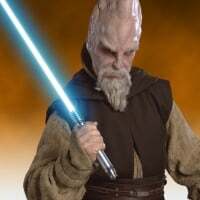 The 41st should only have their camo on Kashyyyk, and on Naboo it should their non-camo Phase II appearance, and Kamino should be their Phase I appearance. What is their "non-camo Phase II appearance" on Naboo you are referring to? I'm glad to see that you guys are making an effort to make the 41st and 327th skins better and canon accurate, really appreciate that. With the recent release of the Elite Corps update, the topic of appearances has never been more prominent within our community. As I’ve said before, we very much appreciate the passion that you have, not just for the Battlefront series, but for Star Wars™ as a whole. We saw all the discussion around the way the 327th Star Corps were received; we read your feedback and watched your videos. Many of you have commented on the authenticity of these appearances and we are working very closely with our friends at Lucasfilm to ensure accuracy in-game. 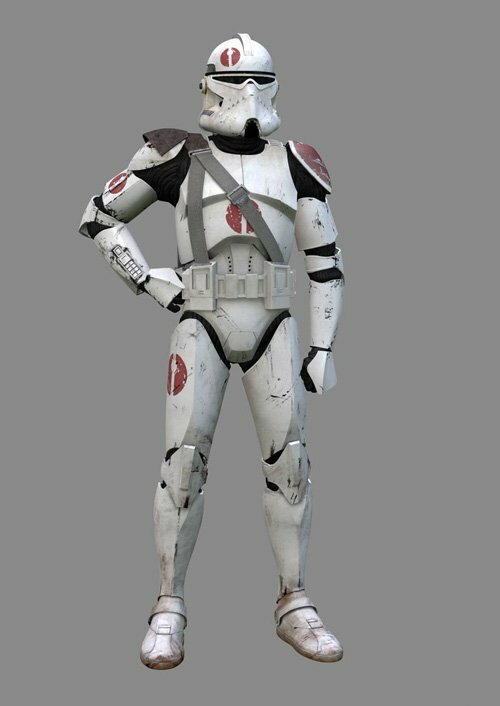 With that, we can confirm that we will be making changes to the current 327th Star Corps appearances, which were modelled after Clone Commander Bly. The modified appearances will be inspired by standard 327th Star Corps troopers and will arrive in a future update this winter. 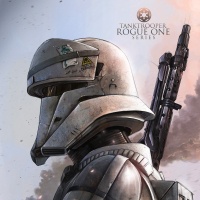 As part of your feedback, we have also reviewed both the 91st Mobile Reconnaissance Corps and the 104th “Wolf Pack” Battalion Clone Troopers, which are part of the September update. We have determined that there are some design changes that need to be implemented for both trooper styles. However, because of the way an update deployment works, all content for September is already locked in what we call “Final” and changing designs now would impact the whole update. Therefore, rather than delay the September release, we will move forward as planned and will release another update at a later time that will make changes to both the 91st and 104th. By releasing the update as scheduled, we better ensure that we can keep to our Roadmap cadence for future updates. It will also let you play with the new appearances, allowing you to manage your credit balances ahead of the release of General Grievous in October. The changes we are planning to make to the 91st focus on a mirroring issue of the symbols on both the arms and legs. 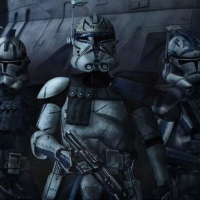 It is also worth noting that the 91st will not have red pauldrons as they are inspired by the “standard” troopers in Star Wars: Revenge of the Sith. The 104th also has mirrored shoulder pads, something we'll address by making one grey and one striped to match the reference. We wanted to talk a little bit about why these changes are happening. The mirroring issue mentioned is a technical issue and one we are working to resolve. Aside from tech, there are also design choices. The initial look of the Clone Troopers comes down to a number of these design choices and inspiration references. 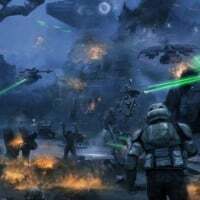 Readability of classes is an important aspect for any game that has an online multiplayer component, and where possible we do try to make appearances that allow you to distinguish the class of Trooper. 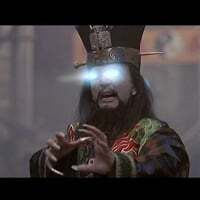 Work is currently underway to fix all of the stated issues. Should you have already purchased the appearances in-game, you will receive the updated versions automatically with no re-purchase necessary. Please do keep your feedback coming. Your passion continues to energise and drive us forward. I find it pathetic that they say it takes all this time to make these skins, with all these 'technical' excuses. There are mods with better skins than you have made since releasing this game. Complete joke. And not to mention that we won't be seeing General Grievous until next month, when he could easily be released now, and let alone all of the other hero's. 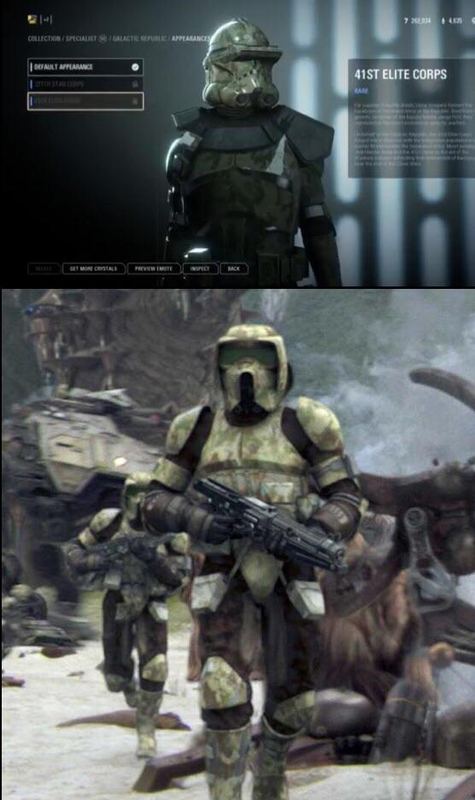 But instead they focus on fixing trooper skins they should have got right the first time. DICE doesn't actually care about the consumer, they're just acting the part so they don't go out of business with this game. For the first photo, that's Commander Gree, a totally unique trooper. Wouldn't work as a normal skin for a regular trooper. For the Phase 1 clones, yeah, that's how the 41st looked in Phase 1 armor...know what they didn't look like? Good decision, together we will do improve this game. It is a lazy photoshop job. Someone on Reddit actually posted a video showing how they found the exact same camo pattern used in this game on a stock image website and then showed how it matched up to the camo pattern in the game's files. It's amazing how DICE couldn't get the actual camo texture from Lucasfilm who would surely have these digital assets archived in some way. Would also like to see theses bad boys;-) I'm done for today. See ya. @F8RGE I find it funny how pandemic nailed most of these skins with their technology they used in 2005! Stop being lazy and release these to the game ASAP, it's not a job that takes months. Just like the 41st supposedly did, although that was just a photoshopped skin from a website, not from Lucas Film archives. Addendum. 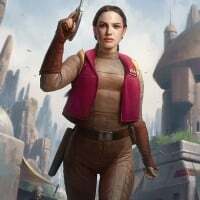 Today it is September 25th yet I do NOT see any september updates and especially no Clone Skins as promised by this... Road Map by EA/DICE.. Maybe I just misunderstood this... Road Map of yours and the updates will come september 2019 or 2020...who the BEEP knows..! 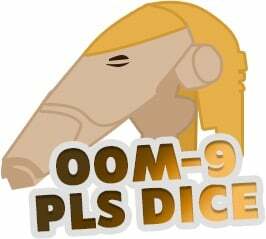 OK do your BEEPING jobs and send out these Clone skins DICE! We already got scamed by you DICE EA once with 1/4 of a game.. Give us the rest that we the customers have already fully paid for! Man Lucasarts was so much better than this BEEPING BEEP! That look is the standard 41st pattern and is canon, seen in Revenge of the Sith, Yoda's departure to Kashyyyk from Coruscant, where he is greeted by a Wookiee warrior and the 41st troopers. 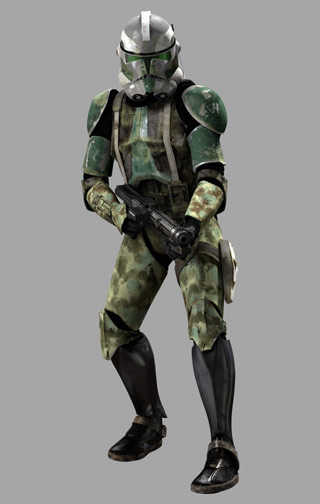 The camo scout trooper is a theater-specific armor design for Kashyyyk. It is not the default skin for the 41st. I only use the Camo trooper skin on Kashyyyk since it makes it harder for the clankers to spot my troopers. Other than that convenience, I could care less about the expensive trooper skins. I still wish I hadn't bought the other one and darned sure will not be buying the new ones. In fact if I had my choice all troopers would be in full black head to toe like the Death Troopers! Last time I checked you can't change skins in the middle of a GA round. Maybe they changed that with the new patch, but I spend more time swapping cards, and changing weapons and trooper classes before spawning again. Not much time to try skins on and ask the wife if I am color coordinated with the rest of my squad or not. LOL. Um, yeah... that's why I'm saying / agreeing that they should make it the standard p2 look for clones on planets other than Kashyyyk. Very cool to see this feedback from EA. I'd like to see some changes in 41st legion, like people have already written. 2. 41st legion's colours look metalized in RotS. The metalized helmet is only for commander Gree the regular troopers look like the assault class with the 41st skin.